“El Castillo del Doctor Bassclar”, es una composición inspirada en la novela escrita por Robert Louis Stevenson titulada “El extraño caso del doctor Jekyll y el señor Hyde” y publicada por primera vez en 1886, que trata acerca de un abogado, Gabriel John Utterson, que investiga la extraña relación entre su viejo amigo, el Dr. Henry Jekyll, y el misántropo Edward Hyde. El libro es conocido por ser una representación vívida de un trastorno psiquiátrico que hace que una misma persona tenga dos o más identidades o personalidades con características opuestas entre sí. En esta obra será el solista de Clarinete Bajo el que con sus destrezas interpretativas realizará el papel del doctor que con sus dos caras ejecutará ambos personajes. Una composición atrayente, compleja para el solista, donde a parte de demostrar su virtuosismo y dominio del clarinete bajo, también tendrá que mostrar sus dotes artísticas en la interpretación teatral, donde todo el escenario será confidente de lo que allí va a suceder. A Daniel Belloví, gran intérprete del clarinete bajo, por su gran interés en la evolución del repertorio para clarinete bajo. Esta composición fue estrenada en el Auditorio de Huelva el 30 de Abril de 2015, siendo sus intérpretes la Banda Municipal de Huelva, Daniel Belloví al Clarinete Bajo, dirigiendo Ferrer Ferran. 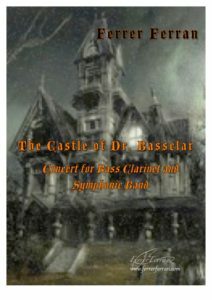 “The Castle of Dr. Bassclar” is a composition inspired by the novel written by Robert Louis Stevenson entitled “Strange Case of Dr Jekyll and Mr Hyde” and first published in 1886, which is about a lawyer, Gabriel John Utterson who investigates the strange relationship between his old friend, Dr Henry Jekyll, and the misanthropic Edward Hyde. The book is known for being a vivid representation of a psychiatric disorder that causes a person to have two or more distinct identities or personalities with opposing each other characteristics. In this work will be the solo bass clarinet that with her acting skills held the role of doctor with two faces run both characters. An attractive, complex composition for solo, where part to demonstrate his virtuosity and mastery of the bass clarinet, will also have to show their artistic talents in theatrical performance, where the whole scenario will be confident of what will happen there. A Daniel Belloví, great performer, bass clarinet for his great interest in the evolution of repertoire for bass clarinet. 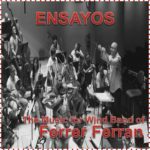 This composition was premiered at the Auditorio de Huelva on 30 April 2015, and its interpreters Banda Municipal de Huelva, Daniel Belloví the bass clarinet, directing Ferrer Ferran. What a fantastic piece! Very masterfully performed Daniel!!! Is the work purchasable at all, I’d greatly enjoying performing this in Australia! Great work, both in terms of performance and composition! I am a Portuguese clarinetist/bass clarinetist. I studied with António Saiote and Nuno Pinto in Escola Superior de Música, Artes e Espectáculo (Oporto), where graduated and obtained the Master Degree of Interpretation. I’m interested in purchasing the work “The Castle of Dr. Bassclar” Concerto for Bass Clarinet and Band. How can I get it?